IN STORE PICKUP ONLY! 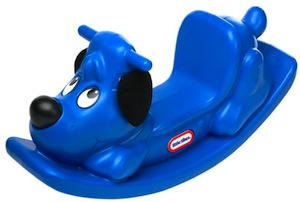 This friendly-faced puppy is just "doggone" fun to ride and may help little ones with balance and muscle coordination skills. Fabric ears for softie play. High-back, textured seat to keep baby upright. Easy grip handles for small hands, and special no-slip foot area. Ages 12-36 months.